Last week for spring break we flew out to Kansas City for a family visit, so I had hoped to come home with a pile of food photos to share. 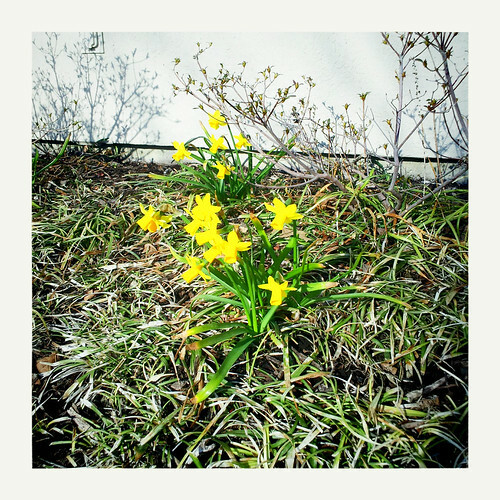 Unfortunately a number of things came up that limited our excursions. 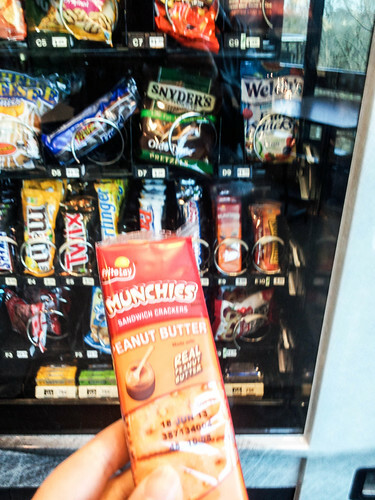 The low point culinarily was probably when I was standing in a hospital cafeteria that hadn’t opened yet for the evening, staring at the vending machine options and weighing the pros and cons of an expensive packet of peanut butter crackers or, frighteningly, a cheeseburger. Yes, a vending machine cheeseburger. No, I was too chicken to try it. I ate the crackers. Thankfully, my father-in-law had laid in a healthy supply of my favorite midwest beers (Schlafly‘s APA from St. Louis and a really beautiful beer from Free State Brewing in Lawrence called Copperhead Pale), and various relatives carted us around to restaurants to make sure we had sustenance. A steak sandwich at The Tavern was incredibly welcome, washed down with their house Sazerac. I gave myself salt poisoning with the very tasty green peppercorn burger at Blanc, ate takeout barbecue from Oklahoma Joe’s, and a lot of Bruegger’s bagels. 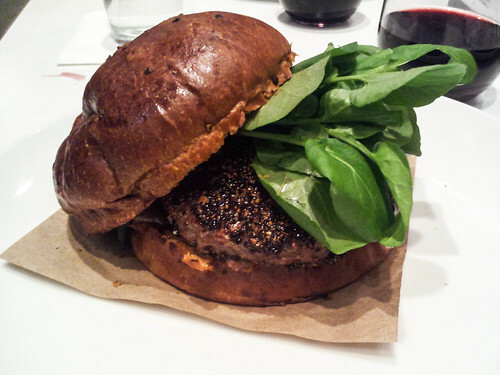 A particular high point was our lunch at Rye, a slightly humbler sister restaurant to Bluestem. Nice place, good bar, excellent cottage fries (which were basically fat, fresh-cooked potato chips), and the shrimp and grits were out of this world. 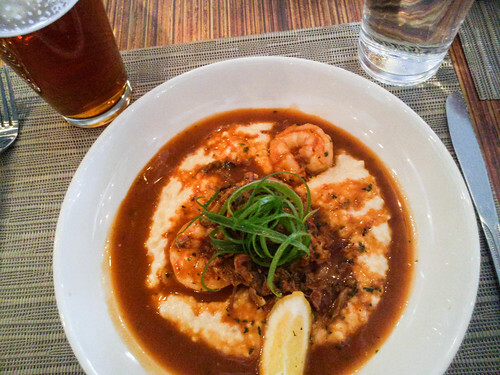 Chunky, cheesy grits topped with shrimp, scallions and a pile of pulled pork and drizzled with barbecue sauce, it was the ultimate Kansas City lunch. I just wish I had had room for their fried chicken as well. For dessert Jon had a slice of bourbon and nut pie, but I decided sobriety was overrated and had a Manhattan. The waitress seemed crestfallen that I didn’t want their house apple-infused bourbon, but brought me a very nice drink anyway. 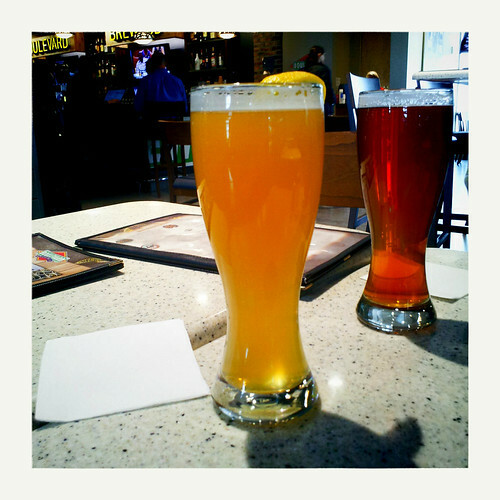 And, of course, on our way home we had to stop at the Boulevard Brewpub in the airport for one last taste of KC.